Herman Cain (currently leading in the polls in North Carolina among Republicans vying for the presidency): "I don’t have facts to back this up, but I happen to believe that these demonstrations are planned and orchestrated to distract from the failed policies of the Obama administration. Don’t blame Wall Street, don’t blame the big banks, if you don’t have a job and you’re not rich, blame yourself! Donald Trump: "Nobody knows why they’re protesting...."
For the record, Romney is the current favorite among Wall Street donors. Still pending: President Obama's apology for cosying up to That Crowd and his recanting of their influence on health insurance reform, among other things. Labels: Barack Obama, corporate power, Donald Trump, Herman Cain, Mitt Romney, revolution in the U.S. He makes some valid points, but the tone is a little too mean-spirited. I bet a lot of the protesters are as hard-working as the rest of us, and they're exercising their cherished American rights by protesting what they see as a system skewed to favor the ultra-wealthy. People sitting in their cars and working hard every day to pay their mortgages may not be able to go out and protest but a lot of us do feel like the 1% needs to wake up and realize we're not going to let them run the world. 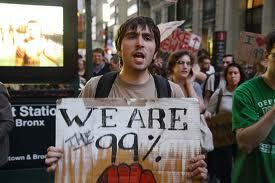 Then why don't they 'occupy' and protest the Federal Reserve banksters? Meh. The Madison protests were similar, staffed by a mix of students and bused-in labor unions. Did the whole camping and yelling thing for weeks (months?). Entertaining, but ultimately a failure. When they've lasted for a couple of years and infiltrated politics like the Tea Parties, then I'll pay attention. The ironic thing is, go to the WeAre99% website and look at how many stories start with their student loans. Honestly, their problem isn't Wall Street, it's that someone told them that taking out $100,000 in loans for college is a good idea. Even before the protest, I was half-convinced I should stop writing grad school recommendations and tell all the high school students I know to spend their first two years at community college, then think realistically about what to do next. Until I do that, it seems like I (like everyone else at ASU) am part of the problem. See, my beef with a lot of the criticism of these protests is that it seems to hinge on the fact that a lot of the protesters are students, as if that makes their situation and views irrelevant. I agree that the cost of college is a separate issue, and one that I could talk about at length. Teahadist, since you work at ASU as I do you know that it's not because educators are raking in big money. However, most of these students are only one or two years away from entering the workforce, and so it's only natural that they are interested, and more than a little worried, about the economy and the job market. Right now some of the biggest job losses are coming from the public sector as budgets are cut left and right. I think it's perfectly reasonable for these kids to question why we're cutting so many mid-level public sector jobs when we've bailed out big corporations and when the wealthy are still enjoying some of the lowest tax rates (for both income and corporate income) of the last 70 years.